It was like hitting a perfect trifecta last Saturday evening at Conroe’s Crighton Theatre. First, the best weather of the year had arrived in Texas with the pleasantly cool temperatures and low humidity of early spring. Next, the brightening world of Daylight Savings Time was just hours away from arrival. But best of all, that night of March 13th would mark the annual finalists concert of the Young Texas Artists Music Competition. For this highlight of the Montgomery County Performing Arts Society season, the society’s many patrons of the arts were out in full force, beautifully dressed, and expecting a night of stunning classical music. They would not be disappointed. Chris Johnson, talented host of radio KUHF-FM’s “Afternoon Concert,” once again served as emcee for the final competition of this three-day event. Eight finalists would compete in one of four categories, and first among them was soloist, Andrew Staupe, in the Piano Division. First performing Scarlatti’s “Sonata in G major, K146,” the exceptionally light touch of his polished technique brought crisp, precise delicacy to the piece, and ended in a virtual whisper. Staupe’s feathery touch and dazzling exactitude were equally evident in his second selection, Beethoven’s “Sonata in F-sharp major, Op.78.” The judges were clearly impressed, and by evening’s end would award Staupe the $3000 First Prize in the Piano Division. The $1000 Second Prize in the Piano Division went to lovely Jeewon Lee, who had the audience cheering in delight at the conclusion of her performance of Franz Liszt’s beautifully melodic, “Faust Waltz.” In an elegantly sheer gown of violet and blue, and with slender arms full of power, Miss Lee’s dramatic and thrilling attack would be thunderous one moment, and exquisitely delicate the next, as she skillfully captured the embracing warmth of the work. The audience did not forget her when it was time to vote for the Audience Choice Award. Miss Lee captured that $1000 prize as well. First up in the Strings Division was cellist, Christine Lamprea, performing Dvorak’s, “Concerto for violoncello in b minor, Op.104 – Allegro.”Dressed in a beautiful gown of black velvet and gold, she projected a focused intensity even as she listened to her accompanist play the opening phrases. Then came the immediately lashing vigor of her attack, head bobbing, and long ponytail fluttering behind as she coaxed the rich tones from her instrument with ivory arms. Tenderness one moment gave way to feverish excitement as Lamprea guided her audience through the thrilling escalations of the piece. I overheard a woman behind me to say, “I didn’t know a cello could do all that!” The judges were impressed as well, and awarded Miss Lamprea the $1000 Second Prize. Meanwhile, the $3000 First Prize would go to violinist, Luke Hsu, for his dazzling performance of Tchaikovsky’s “Violin concerto in D major, Op.35.” With ferocious and mystical precision, Mr. Hsu exhibited stunning and non-stop virtuosity performing a work that races forward from the very first passages. In the Brass, Percussion & Woodwinds Division, saxophonist, Zach Stern, first performed Glazounov’s “Concerto in Eb for saxophone.” With its slow and seductive opening and then its jazzy complexity and playfulness, the piece seemed to offer a complete tour of the instrument’s possibilities. Stern followed with the Joseph DeLuca composition, “Beautiful Colorado.” This piece was more clearly melodic, but no less complex and appealing. Stern’s handling of the galloping conclusion was stunning, and would win him the $1000 Second Prize. First Prize in this category would be captured by flutist, Aaron Perdue, who could have charmed the birds out of the trees with the lilting loveliness of his graceful rendition of Pierre Sancan’s “Sonatine for Flute and Piano.” A boyish spirit of fun, a youthful assurance, and a justifiable confidence marked his performance, as he moved freely about the stage with the ease of a dancer. The final category was the Voice Division, and brought lovely Leslie Marks to the stage in a beautiful floor length gown blending dark blue and brown. Her first selection, Massenet’s “Je suis encore” from Manon, was full of gaiety, joi de vivre, radiant charm, fine breath control, and an easy grace on stage. Her lovely soprano voice had a bird-like purity and sweetness, and even her in-character laughter was perfectly on key. Her second selection was Verdi’s “Caro Nome,” from “Rigoletto”. With astounding control and vocal range, she beautifully ascended the delicate stepping-stones of this enchanting and joyful aria. I found myself hoping the spirit of Verdi was somehow peeking in on this lush and lovely performance that would capture the $1000 Second Prize for Miss Marks. 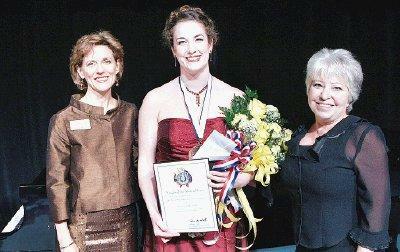 The $3000 First Prize would be captured by mezzo-soprano, Sarah Mesko. In an elegant burgundy gown of rich satin, her delicate ruby necklace was even visible in the balcony. She brought vocal passion to the Letter Scene from Massenet’s “Werther,” and seemed unperturbed when the evening train roared past on the railroad tracks behind the theatre. (I think there should be a good-humored $100 bonus prize for the artist who gets stuck performing during the passing of the train.) As though nothing had happened, Mesko plunged beautifully onward with Strauss’ lusty aria, “Sein wir wieder gut” from Ariadne auf Naxos. The train and talent must have brought her luck. She would be further rewarded with the evening’s Grand Prize, yet another $3000.